Our troop recently completed a journey to attend "Starburst '98" an International camporee in West Sussex, England. Follow this link to view the flags that represent the countries we made new friends with! One of the greatest pleasures during our trip was the warm hospitality we enjoyed from Guiders who took us into their homes and cared for us far beyond the call of duty. They truely lived our Promise and Law. No Girl Scout Page would be complete without a link to the GSUSA page which now offers online shopping for you to get those nifty offical Girl Scout items! 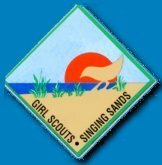 Our name is Senior Troop 13, and we are proud to be Singing Sands Girl Scout's!